Films having the idea of Bigfoot or aliens has always been popular with film fans. Is it because we are intrigued by the unknown or is it just that we know deep down we are not alone? Either way, SIGHTINGS takes both those phenomenon and push them together to form this creature feature. The film follows a dysfunctional family that are living on a ranch in Texas and how they must overcome their interpersonal conflicts to deal with the threat that is coming for them from the woods. Former sheriff Tom Mayfield (Boo Arnold) joins the fight with his conspiracy nut brother in law, against the Bigfoot who is trying to take Mayfield's daughter from him. It would seem that Bigfoot has a tendency for people with the blood type O negative, which just so happens to be the blood type of Mayfield's daughter and his missing wife. Along comes Cryptozoologist Rebecca Otis who has a theory that Bigfoot is really an alien and is used to scout the Earth and enjoy the sweet blood of the O negative Earthlings. Of course we now get everybody doing their best to fight off the threat and save the day. Do they really save the day though as they may get rid of one Bigfoot, surely there is more out there.....somewhere. SIGHTINGS is at times slow and has a tendency to have characters standing around doing nothing just to fill time which can (and does) get annoying throughout its 91 minutes running time. 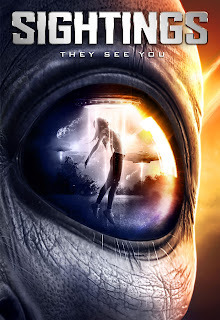 Though the film has some interesting ideas, most notably that Bigfoot is actually an alien scout, you don't get to see much of the blood hungry hairy beast which will disappoint those hoping for a rampaging creature feature. The acting is not the best as it seems everyone is sleepwalking their way through it, with the exception of Rawn Erickson as kooky Uncle Rickey taking the award for best actor in this film. With a snappier script and less padding this could have been one of the better Bigfoot/alien movies for a few years, but SIGHTINGS looks destined to be lost in the woods with other lesser creature features.